The word "pigeon" evokes thoughts of gentle cooing, fluttering in rafters, and poo-encrusted statues. The species responsible for the encrustation is deeply familiar to us, having ridden waves of European expansionism to inhabit every continent, including Australia. First domesticated thousands of years ago, urban pigeons have turned feral again. Australia and its neighbouring islands are the global epicentre of pigeon and dove (or "columbid") diversity with the highest density of different columbids – an impressive 134 species – found in the region. Twenty-two of these native species are found in Australia alone, in just about every habitat. These native species play an important role in ecosystem functioning: they forage for and disperse seeds, concentrate nutrients in the environment, and are a source of food for predators. Fruit doves for example, are zealous fruitarians, and the region's tropical rainforests depend on them for tree diversity. Where fruit-doves have disappeared in the South Pacific, numerous plant species have lost an effective dispersal mechanism. The future of Australia's native pigeons however, may depend on our domestic pigeons. Australia's domestic pigeon population—both feral and captive - is large and interconnected by frequent local and interstate movements. Pigeon racing, for example, involves releasing captive birds hundreds of kilometres from their homes only so they may find their way back. While most birds do navigate home, up to 20% will not return, of which some will join feral pigeon populations. Birds are also traded across the country and illegally from overseas. These movements, together with poor biosecurity practices, mean that captive pigeons can and do mingle with feral domestic pigeons. And here's a paradox. Could Australia's feral domestic pigeons become the vector for a dramatic decline of columbids – native species on which Australian ecosystems rely? In recent years, two notable infectious diseases have been found to affect our captive domestic pigeons: the pigeon paramyxovirus type 1 (PPMV1) and a new strain of the pigeon rotavirus (G18P). These diseases are notable because in captive domestic flocks they are both spectacularly lethal and difficult to control. PPMV1, although likely to have originated overseas, is now endemic in Australia. This virus has jumped from captive to feral domestic pigeon populations on several occasions, but fortunately has yet to establish in feral populations. Pigeon paramyxovirus and pigeon rotavirus are known to have escaped from captive domestic pigeons into feral domestic pigeons (black arrow). The risk is that these viruses will establish in feral pigeon populations and cause epidemics in our diverse and ecologically important wild native columbids (red arrow). G18P is thought to have spread to Victoria and South Australia from a bird auction in Perth in 2016. PPMV1 also spread rapidly to multiple states following its first appearance in Melbourne in 2011. The movements of captive pigeons, and their contact with their feral counterparts, can be the route through which virulent and lethal diseases – such as the PPMV1 and the G18P – may spread to Australia's native columbids. Fortunately, neither PPMV1 nor G18P has crossed over to Australia's native columbids. We can't say how likely this is, or how serious the consequences would be, because we have not previously observed such viral infections among our native pigeons. If the viruses prove equally lethal to native columbids as they are to domestic pigeons, we could see catastrophic population declines across numerous columbid species in Australia over a short period of time. Should these viruses spread (via feral domestic pigeons), the control and containment of losses among our native pigeon species would be near impossible. Such a nightmare scenario can only be avoided by predicting if and how these viruses might "spill over" into wild columbids so that we can prevent this in the first place. Agricultural poultry is routinely screened to check their vulnerability to threats like the PPMV1 and G18P. Such screening is an appropriate response to protect our agricultural industry. For our native pigeons and doves however, no such similar testing is planned. 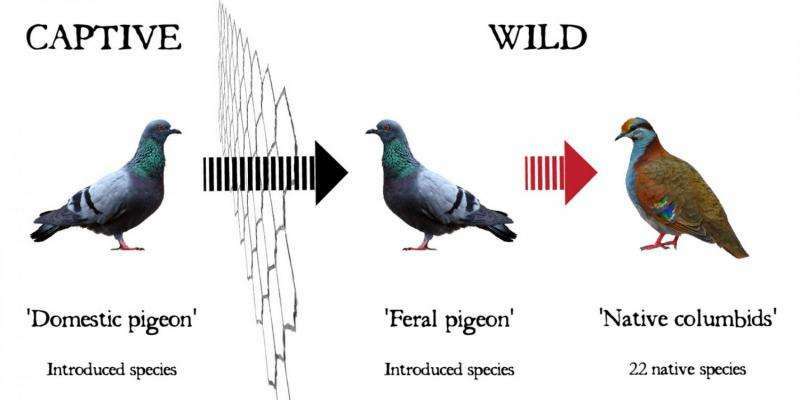 Based on progress in veterinary vaccine development and advancements in understanding of feral pigeon control, the knowledge and technology required to mitigate this threat should be relatively inexpensive. The threat for these species can be actively managed, now, by improving our biosecurity and vaccination programs for captive domestic pigeons, and eradicating feral domestic pigeons. The protection of our native columbids however, ultimately relies on valuing their ecosystem functions in the first place.